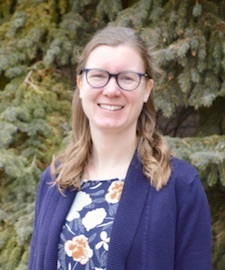 As Administrative Associate at the Haub School, Colleen assists Dean Benson, coordinates front-line reception at the Kendall House, contributes to office management and scheduling, and is a liaison between Haub School partners and Haub School faculty and staff. Colleen has worked throughout the West and Midwest helping connect people and place. In Michigan she coordinated a Great Lakes Stewardship Initiative hub. The hub partnered K-12 teachers with professional development opportunities and local resources to guide students through relevant community-based environmental learning in the Lower Grand River Watershed. As a middle school teacher on Montana’s Blackfeet Indian Reservation, she frequently led students on excursions into Glacier National Park. Colleen has also supported place-based education programs in Grand Teton National Park through her work as an instructor and project coordinator at the Teton Science Schools. Bourque, C. & Houseal, A.K. (in press). "Lessons Learned from Museums: A Literature Review on Family Learning and Recommendations for the National Park Service." in Thompson, J., Houseal, A. & Cook, A. (Eds. ), America's largest classroom: What we learn from our national parks. Bourque, C., Houseal, A. K., Welsh, K., Wenger, M. (2014). "Free-choice family learning: A literature review for the National Park Service." Journal of Interpretation Research, 19(1), 7-29. Posthumus, M., Bourque, C., Sevigny, L., Marckini-Polk, L. (2015, March). "Students to Stewards: Shaping Science Education Through Community Partnerships." Presented at the National Science Teachers Association National Conference. Chicago, IL.